Milwaukee has always considered park names open to change. The strip of greenery in the median in front of Central Library, for instance, was once Washington Park. The present-day Washington Park was originally West Park. Pere Marquette Park is along the downtown riverfront, formerly it was several blocks south and in front of the Milwaukee Road station. 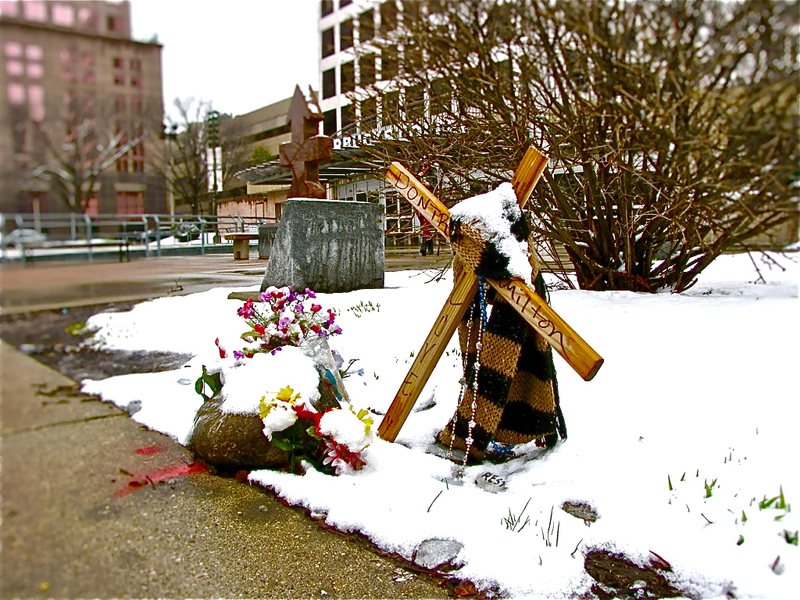 The station is gone, but there is still a park – now called Zeidler Union Square. And then there is the strange history of Red Arrow Park. The original park was between 10th and 11th streets on Wisconsin Avenue, across the street and to the west of Central Library. Originally the land was James Kneeland’s estate, famous for its cost-is-no-object landscaping. In the mid-1960s, the park was bulldozed to make way the Marquette Interchange. The present Red Arrow Park is on North Water Street, north of City Hall. Before it was a park, the land was, in part, the site of Kitty William’s cost-is-definitely-the-object brothel and famous for the lavish decor of its 42 rooms. The Roman room, for instance, had a sunken floor, marble baths, and running fountains. In 1911, when District Attorney Winfred Zabel cleaned up Milwaukee’s red light district, Kitty Williams’ place was the first to be shut down. After a failed attempt at running a tavern, Kitty lived largely in seclusion in her grand, empty “sporting house” until her death in 1943 at age 79. The building was demolished in 1963 and the land became a parking lot for City Hall employees. History has been surprisingly kind to the “Queen of Milwaukee′s madams.” One of the rooms of her house is featured in the Milwaukee Public Museum’s Streets of Old Milwaukee exhibit (it’s above the optometrist’s shop). James Kneeland? Pretty much forgotten. Kneeland, whose elegant estate became the first Red Arrow Park, arrived in Milwaukee in 1841. He opened a general merchandise store and prospered. He gave up his store in 1852 to concentrate on real estate development. A staunch Episcopalian, Kneeland was one of the leaders of St. James church, which still stands to the east of his old property. Milwaukee was barely more than a village when Kneeland and his wife purchased land that was then far out in the country. Kneeland promptly filled in a ravine to form a lake east of his residence, and set to work beautifying his property. In the 1920s, the Kneeland estate sold the property to the county, which planned to build a courthouse there. When that fell through, the land became a park where adults relaxed in the shade of the beautiful trees Kneeland had planted. His manmade lake, where once swans and ducks swam, became a popular wading pool. The park was given a name much on the minds of Milwaukeeans in those years immediately following the First World War. In World War I, Army National Guard soldiers from Wisconsin, many of them from Milwaukee, along with National Guard units from Michigan were mobilized to form the U.S. Army’s 32nd Division and sent to France. Fighting for six months with only 10 rest days, the division suffered more than 14,000 casualties. On Oct. 4th, 1918, after nearly a week of fighting north of the Argonne forest, the division’s soldiers became the first to break through the heavily fortified Hindenberg Line, Germany’s last real line of defense and one the German Army had been ordered to hold at all costs. Continuing to press forward under continuous machine gun and artillery fire, the Wisconsin soldiers defeated 11 German divisions, including the elite Prussian Guards. Those three weeks in October cost the division nearly 6,000 casualties, nearly half its losses for the entire war. Many were from Milwaukee. Soldiers of the 32nd Division wear a shoulder patch honoring the tenacious fight in the Argonne. The insignia is a line shot through with a red arrow signifying the piercing of every battle line the enemy placed before it. During World War II, the division was the first to deploy as an entire unit overseas and among the first to engage in offensive ground combat operations during 1942. Fighting in six major engagements in the Pacific, the Red Arrow Division logged 654 days of combat in World War II, the most of any division in the U.S. Army, and suffered 7,268 casualties. Now known as the 32nd Division Red Arrow Infantry Brigade Combat Team, units served in staggered intervals during Operation Iraqi Freedom from 2004 to 2010. Soldiers Todd D. Olson, Charles A. Kaufman, Michael Wendling, Andrew Wallace, and Ryan Jopek died in the operation. Eventually, the county decided to build a new Red Arrow on the parking lot north of City Hall. The only real opposition came from City Hall itself, which, having finally gotten an employee parking lot, was loath to give it up. The park was completed in 1970 and was instantly despised. It earned a “Crabgrass Award” from a panel of landscape architects unimpressed by its reliance on concrete. 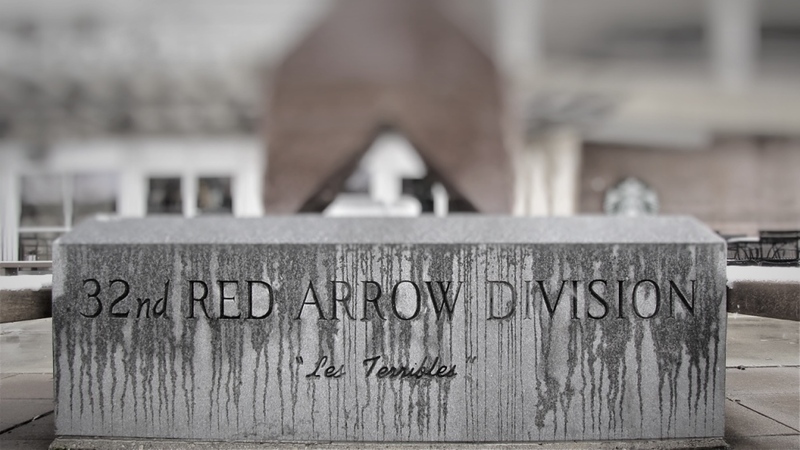 “At this site on Nov. 11, 1984, a red granite monument 8 feet high and 4 feet wide was dedicated in honor of the men who served in the Red Arrow Division. Here, families and loved ones of the more than 24,000 casualties in the two world wars can honor and remember the dead. The rink was built at a cost of $2.4 million. It opened to the public in December 1999 and immediately became a popular downtown attraction. The little park, at last, has a raison d’etre. “Perhaps little children, splashing in the wading pool on a warm day, or coasting on the slopes of the park in wintertime mark our memory of the soldiers more graciously even than would a statue or a stately shrine. Perhaps the soldiers who did not come back would think it better that tired men and women, escaping from the brick and mortar of the neighborhood, should find rest and comfort in an enclosure bearing their division name than the hurrying crowds should scan hastily a tablet recounting their deeds. Lost Milwaukee, a new book from The History Press containing the very best from Milwaukee Notebook, is now available. Click here for more details. 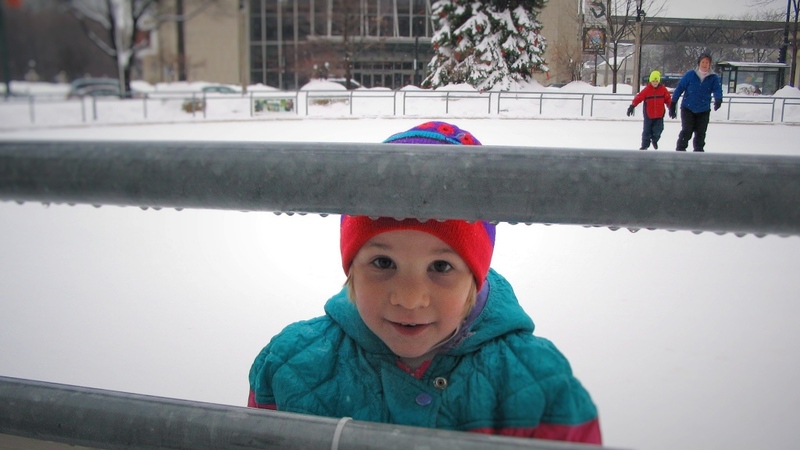 My dad took me to Red Arrow park when I was very young. I can’t remember too much about it, but I do recall that I had a great time feeding the ducks. My grandfather had mentioned several times, that his childhood friend ( Pvt. Roy Hopp) was killed at Chateau-Thierry, during the Aisne-Marne offensive on 31 August 1918 , while serving in Company F 127th. Inf. Regiment of the 32nd. Division . While researching Mr. Hopp’s name in the central library, I found a photo of him in uniform. Grampa died in 1973, but it was great to put a face with the name of his old 3d. Ward buddy after all these years !! Thanks for sharing your story of the 32nd! John Gurda could not have told this story any better!! Great blog- I’ve shared it to my Facebook and added a link to your blog from my blog. Is it hard to find pictures of the original Red Arrow Park since you only showed a postcard view? Finding photos can be tricky. There is a 1950s photo that I know of, but it is a newspaper image, and they generally charge quite a bit of money for reprint rights. Besides, the postcard is an older view. I grew up living just 2 blocks from the original red arrow park in the 1940s. anybody else from that area and time would really like to hear from them.